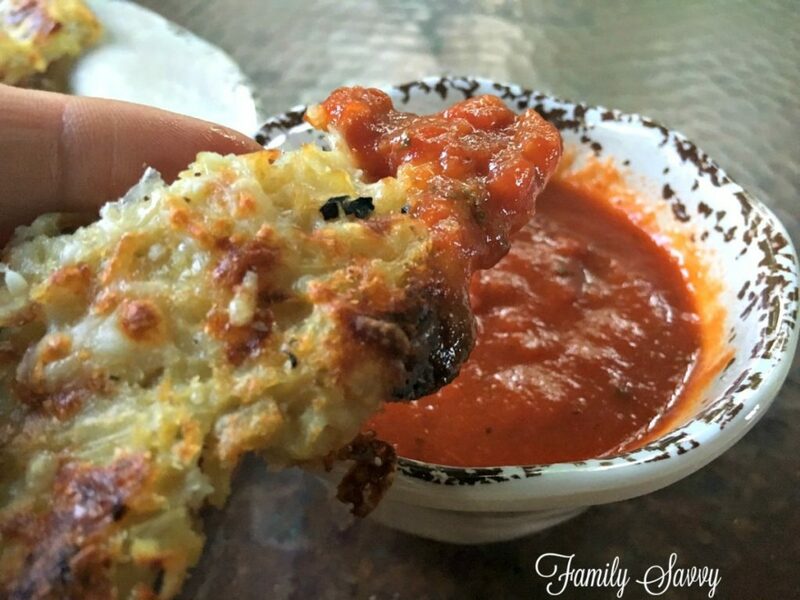 These cheesy cauliflower breadsticks are low-carb, absolutely yummy, and super easy to make with store bought cauliflower crumbles. Store bought cauliflower crumbles are now readily available on store shelves, making it easier than ever to make yummy, low-carb treats. Once you try cauliflower as a starch substitute, you’ll be amazed at how wonderful it is. 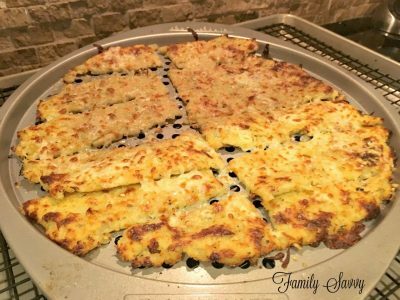 Last week, I blogged about this cauliflower crust pizza. It was a huge hit with the fam, and I plan on adding it to the meal rotation. These are super easy to make but do require a bit of in and out of the oven and flipping the crust. The reason this in necessary is to ensure that both sides of the crust bake to a golden crusty exterior. It also makes the breadsticks more breadlike so that they can be picked up and eaten like real bread. A few handy kitchen tools can make this process a lot easier, especially if you plan to make cauliflower crusts often. Pizza pans with holes and a large baking grid make the process a snap. Two of my faves are below. This Faberware Pizza Crisper lets air circulate underneath the pan so that the bottom of the crust will get cooked more quickly. I keep two of these and use them to “flip” cauliflower crust so that both sides can be perfectly browned. I love this 14 1/2 x 20 Nonstick Baking Grid and simply place it atop a foil lined baking sheet to bake or roast foods that need circulation and even browning. If you try these, please leave feedback! I hope someone out there enjoys these as much as we do:-) As always, thanks so much for stopping by. Be blessed, and stay savvy!!! Cheesy, savory, garlicky "breadsticks" without the carbs and without the guilt! Tear cauliflower bag at notch. Close bag with zipper leaving a 1â€ opening. Place bag standing up in microwave; microwave on HIGH 4 minutes. Allow to sit for 1 minute before opening bag. Open bag; spread cauliflower on clean towels or paper towels to cool for 10 minutes. With paper towels or towel, squeeze all liquid from cauliflower crumbles. Return Cauliflower to a large bowl. Add egg white, 1 cup mozzarella, 2 TBS parmesan, cornmeal, and all seasonings. Mix until the ingredients form a loose dough ball. Place mixture onto parchment paper atop a pizza pan; pat into a 10â€ circle. Place pizza pan with cauliflower crust onto wire cooling rack place atop a foil lined baking sheet. Bake 20-25 minutes or until top of crust is lightly brown. Flip the crust over onto another pizza pan (lined with parchment). Return to oven and bake until the other side is golden (usually 10 minutes). Remove from oven; cut into pieces similar to breadsticks. Sprinkle cut crust with remaining parmesan and cheddar. Broil directly under coils until cheese melts (watch carefully; this happens quickly)! Serve with small bowl of pizza sauce or marinara.